On Saturday August 4, I had the privilege of meeting Pastor Khem Arcojada, his mother, Aida, from the Philippines, and his sister and her family who now live in Virginia. Khem is the pastor of First Eastside Baptist Church in Valencia City, Bukidnon, Philippines where his father was the pastor until his death. The Arcojadas were in the US visiting family and were able to drop by to see our offices and to share how Inasmuch impacted their church and their community. David Smith, formerly of the Radford area of Virginia, introduced the Inasmuch model in the Philippines and sponsored the Inasmuch Day at First Eastside in Valencia City. David now lives in the Philippines with his wife and her family. Earlier in the summer we received a report from Rwenzori Organization for Children Living Under Difficult Circumstances (ROCDiC) in Kasese, Uganda. 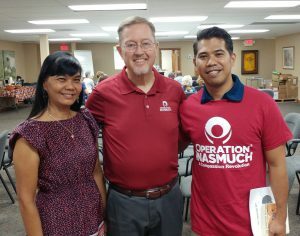 The first contact we had with Ivan, the director of the ministry for refugee young people, was a request for Operation Inasmuch shirts for them to wear as they served another ministry in their area. In early June the staff and residents of ROCDiC wanted to give back and chose to conduct an Inasmuch Day by serving the Burumbika Health Center. They completed several projects around the grounds and facilities there. View pictures from their event here. 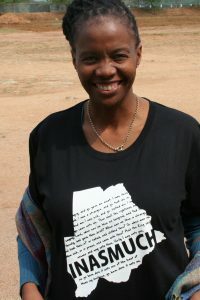 Another international Inasmuch Day is being planned for September 22 in Gaborone, Botswana. This will be at least 8 years that Open Baptist Church, an international church with over 30 nations represented, has utilized Operation Inasmuch to be the hands, feet, eyes and heart of Christ among their neighbors in the capitol city of Botswana. Beauty Mokoba is the coordinator for the Inasmuch Day and will be our featured guest at our annual Donor Appreciation event planned for October 23 in Fayetteville, NC. View pictures from their 2016 event here. What do all of these have in common? In various locations in very different parts of our world, churches and organizations are finding the Inasmuch model of compassion ministry to be a valuable tool for moving their people from the “seats and into the streets” to serve their neighbors and to share the Good News of Jesus. From an urban city on the island of Mindanao in the Philippines to a village in the mountains of Uganda to the capitol city of Gaborone, Botswana, Christians are choosing to follow in the steps of Jesus by meeting their neighbors at their point of need. These brothers and sisters in Christ are feeding hungry people, welcoming strangers, repairing homes, helping families, and attending to the sick and imprisoned. They are encouraging school children, doing projects that improve their communities, and working collaboratively with other organizations and faith communities in their cities and towns. They are sharing the Good News of Jesus and transforming lives for eternity! What a joy to be part of God’s kingdom ministry literally impacting people around the world through the Compassion Revolution of serving the unserved, loving the unloved, and reaching out to those without a faith community, without a church.